Marge: "Watch out for the shock attack!" Bart: [basketball hits Bart in the face] "Ow!" Marge: "I told you to watch out.."
"Ralph, you're also not a trophy." Hi. I'm . I'm a formerly frequent editor at Wikisimpsons, and self-proclaimed Wiki Hallux. I'm also a member of Project Re-Watch. Made the Mister Honeybunny page. Attended and directed the November 5th, 2011 editor meeting. I am the second oldest rollback, having been promoted on January 30, 2011 (behind Dohayecarumbadoh, promoted June 3, 2010). I've written the transcript for "Gump Roast", "Treehouse of Horror XXII" and "The Falcon and the D'ohman". I made the 14,000th page! Chris Ledesma is a "lucky, luck guy". "Simpsons Roasting on an Open Fire" - Nothing beats a classic! The Simpsons in its prime! "Don't Fear the Roofer" - A pretty cool plot! "Marge Gamer" - MMORPGs?! Heck yeah! 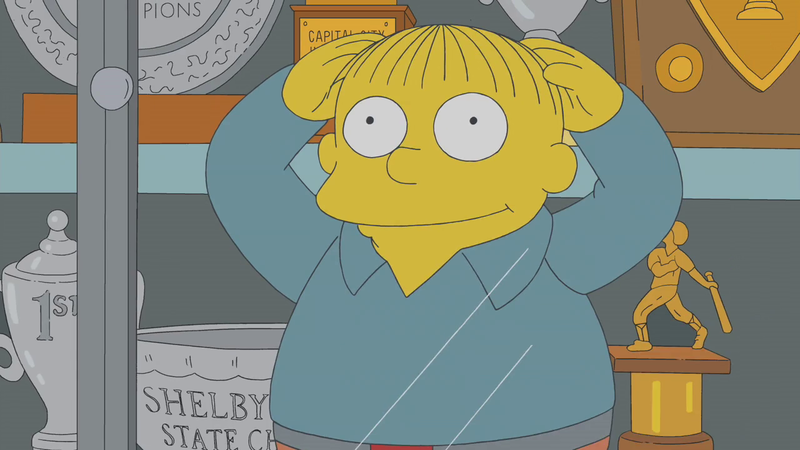 Ralph Wiggum - Need I say more? Yes Guy - Mmmmm yeeeeeesss?? I have 1,492 (ShoutWiki) + 61 (Wikia) + 4,540 edits to Wikisimpsons! Modified on February 21, 2015, at 10:58.